Apollo (Greek mythology) is one most well-known of the Greek gods, and was worshiped as one of the primary sun gods in the ancient world. He is one of few gods who does not have a different name in Roman mythology than he does in Greek mythology. We all know how important the sun is to life on Earth (as in, it wouldn't exist without it), and though they did not quite understand the science behind it all, the ancient Greeks knew well that pleasing the sun god was vitally important. Apollo was therefore a very popular and highly worshiped god who was also associated with healing, herding, music, and the arts. Apollo is the son of Zeus and Leto, and has a twin sister, Artemis who, appropriately, is the goddess of the moon. Both were skilled with a bow and arrow, though bow hunting was certainly Artemis's primary function. 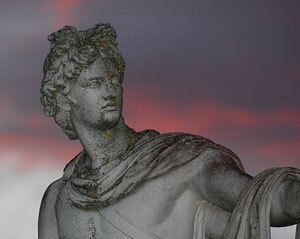 Apollo is often shown with a bow, but also a sword and a lyre (made for him by fellow god Hermes). He also rode a chariot through the sky drawn by three horses made of fire. In Greek mythology Apollo appears in several tales, including the Trojan War where he took the side of the Trojans, and in the ancient story of his battle with Ladon the Python in the Garden of the Hesperides. In the latter, Apollo kills the snake guarding Delphi, which was thought to be the center of the Earth. Once victorious, the spot became home to the great Temple of Apollo, where the Oracles of Delphi resided. Every four years the Greeks would host the Pythian Games in Delphi in honor of the athletic god's victory over the Python. The Oracles were also known as "Pythia" in respect to this great victory. The Pythian Games eventually combined with similar events to become what we know today as the Olympic Games. Apollo also shows up in more modern mythology where he unintentionally helps create the first vampires by cursing a human rival to be burned by Apollo's sun should he ever come into the daylight again. Return from Apollo Mythology to the List of Greek Gods and Goddesses.